Discussion in 'Downhill & Freeride' started by fred.r, Feb 6, 2013. Anyone using the POC Joint VPD 2.0 pads wanna comment on the "hardness" of the protection? Would you say they're somewhere in between pads like the TLD T-Bones/661 Straits and a hard-shell pad like the Fox Launch? Looking for new knee pads that offer more protection than the T-Bone/Straits. Overall impressions and comparisons welcome too. I don't have TLD pads, but my buddy does. IIRC the padding in those pads are somewhat thick, but not very dense. I've used a couple pairs of Kyle Straits over the years and I regard them as very light duty pads. Very comfortable, but not confidence-inspiring, and not durable. My VPD 2.0s are pretty robust feeling, and fit well. 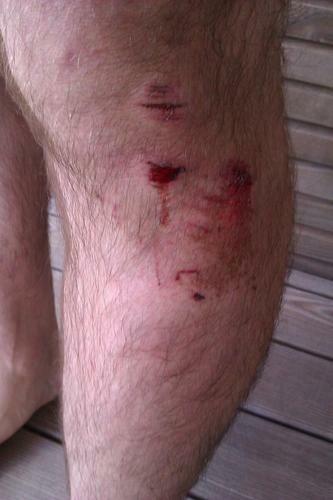 The velocity-sensitive padding didn't save my knee from a high-speed bar-smash, but I don't know what would've. I wish the VPDs had a little more coverage above the knee, and the long one piece knee/shin wasn't quite long enough to save my lower shin from stiches. If you're looking for complete shin coverage, I would go with the short VPD knees and separate VPD shin pads. that was a low-speed crash on gravel (i didn't pay attention on my way to the trail head), i don't dare to imagine what my leg would look like after a serious crash. i had the POC Bones pads before i got these, which are hard plastic and they are so much better. i strongly recommend not to get the Joint pads. bad product from a company, that otherwise offers good stuff.. I have the older version of the POC Joints and they have protected my knee surprisingly well. The only type of crash they might be useless in is if you land on a very sharp rock that pierces the VPD. For impacts on more blunt stuff, they are really good. @ worhsip mud, i'm guessing they shifted on you during the crash? @ op regarding the "hardness". I've got the original VPD kneepads. They are rather firm just sitting by themselves. But once you put them one, they start to warm up and become notably more pliable. Some mixed reviews, wasn't expecting that quite honestly. Trying to get hardshell like protection in a soft material package isn't possible yet. I've only heard good things about POC products until this thread. Any other pads you guys would recommend that offer more protection than the T-Bone/Strait/Evo options but aren't super bulky. I used to run the old 661 moto knee's with the 661 Pad Locks with good results and have toasted my knee twice since, once in Straits and once the T-Bones (most recent resulting in a dented kneecap). Edit: FWIW i have tried the roach knee shins, 661 knee shins and 661 Kyle Strait. The POC are the best protection for my knee and the most comfortable. For some reason I tend not to have much issue with pads slipping. The Padlocks were used because the 661 Moto-knee's didn't have a top strap for the knee portion of the pad since they're usually worn under moto-pants. Neither the pad or the lock made anymore anyways. I might check out the TLD Combat Knee short pads. Viking pants for all out DH, but everything else it is the Scotts. Tomasis, I feel your pain. I tore my ACL in 96 and rehabbed and have taken good care of it eve since. Last spring, I was pedaling my DH bike while sitting down in a grass field waiting for my race run. Hit a fence post lying in the tall grass and went down clipped in on my left knee and have ripped it up on the other side badly. I've crashed on the POC 2.0 plenty. Never had them slide off, always have great protection. If they fit you then they'll work and not slide. If they don't fit you've got to move on. Pads fit everyone differently. What works for you might not work for me and vice versa. Best of both worlds. I use the POC 2.0 DH now and it's great. Best protection of any pad I've ever used, and never had them slide on me. I have the POC 2.0 DH, best knee shin pads I've used for having them stay in place and not expose my knee in a crash. I think that what many people don't realize is that what keeps pads in place (the concept is the same on a pair of $2400 custom laminated carbon-graphite osteo-arthritis knee braces or a pair of POC pads) is the lower (below knee) strap tightness and how snug the pad fits around the back of the knee to the upper calf. If you have chicken calves, you're kinda screwed, but ensure that the pad is sufficiently snug and strap cinched down on this area and you won't get migration. The tightness of the upper strap doesn't matter as far as pad slippage goes. Which is why the RaceFace Ambush are so good. Two layers of velcro can be set VERY tight if you need to. Upper and lower strap. Them pads don't budge.